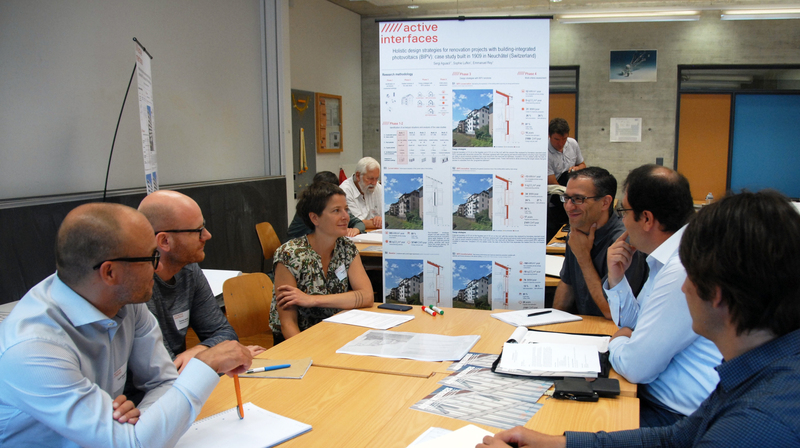 An expert workshop aiming at evaluating the relevance of the strategies for renovation projects with building integrated photovoltaics (BIPV) developed within the ACTIVE INTERFACES research project took place on June 12thin Fribourg. The ACTIVE INTERFAECES interdisciplinary research project, supported by the National Research Programme NRP 70 “Energy turnaround” of the Swiss National Science Foundation (SNSF), focuses on building integrated photovoltaics (BIPV) in urban renewal processes. After identifying the lack of information and convincing examples as one of the major obstacles, the research team has developed a series of five case studies on representative buildings from different periods of construction located in the city of Neuchâtel. For each building, renovation scenarios with BIPV have been developed. In this context, the expert workshop gathered approximately twenty-five participants to evaluate the relevance of these proposals. Five categories of renovation processes stakeholders (architects, engineers, manufacturers, representatives from public authorities, owners) were solicited to think critically and express their receptivity towards the renovation scenarios – in particular in terms of architectural integration – and, more generally, towards the impact potential of the project. The day’s work was divided into two parts: the morning session was dedicated to small group discussions, while the afternoon focused on an assessment using a voting system with clickers. The detailed results of these evaluations – generally positive – will soon be published.